Baseball Bits #11: How Much are Harper, Machado, Really Worth? Welcome to the final article of my initial 2018-19 MLB free agency coverage. Bryce Harper and Manny Machado may be the Top 2 free agents of the off-season, but how much money are they really worth? Keep reading to find out my take. If you haven’t seen them yet, you can also check out my previous MLB free agency articles at the links below. In February, I may also have some updated predictions on where the final remaining free agents will sign, so stay tuned. Week of January 21: Baseball Bits #11: How Much Money are Harper, Machado Really Worth? It’s been a crazy off-season so far. The Mariners have completely refreshed their roster, and the Dodgers dealt away Yasiel Puig and Matt Kemp in one trade. Winter Meetings were not only full of trades, but also free agent signings. Many of the top free agents, including Patrick Corbin, J.A. Happ, Nathan Eovaldi, Michael Brantley, Josh Donaldson, Wilson Ramos, Yasmani Grandal, and Andrew McCutchen have been signed. But the top two free agents of the off-season, Bryce Harper and Manny Machado, remain unsigned. 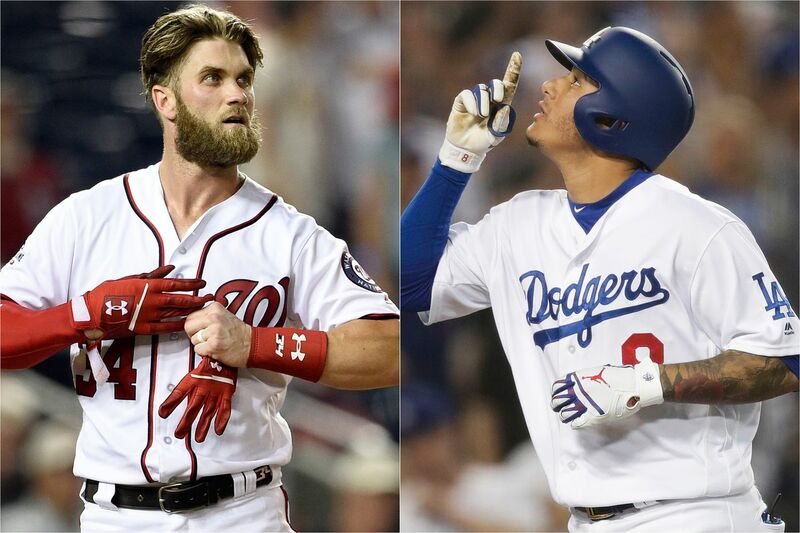 Harper and Machado are regarded as a couple of the league’s best offensive players, and among free agent batters, Harper and Machado were the Top 2 in oWAR. Both Harper and Machado are capable of making a mediocre team a contender, or making a team that’s already a borderline playoff contender a relevant World Series contender. Machado met with three teams in December: the White Sox, Yankees, and Phillies. He is likely going to sign with one of those three teams, but he has not made his decision yet, though he has reportedly narrowed it down to the White Sox and Phillies. Originally, I had predicted that Machado would go to the Phillies. But after their acquistion of Jean Segura, I see the White Sox as the best fit. There could be mystery teams in on Machado though, according to several newer reports. Harper has not met with any teams yet, but the Dodgers, Cubs, Nationals, and Phillies among others have shown interest. After trading away two of their outfielders and more to the Reds for next to nothing, it would not be smart for the Dodgers to pass on Harper. But I think there’s a chance he’ll sign with the White Sox or Phillies as well. Although they have some different suitors, one thing Harper and Machado have in common is their demand for a big contract. Harper turned down a 10 year, $300 million contract offered by the Nationals back in September. Machado could also reportedly sign for $250-300 million or more. But are Harper and Machado, let alone any free agent batter worth that much money? I did some research on some free agents throughout the last 12 years. I looked at free agent batters and pitchers who were Top 50 in oWAR or pWAR the season before they hit the open market who ended up signing for at least $12 million/year and at least $45 million total. I researched their stats the following year. Did their WAR improve or decline? I looked at other stats too, like OPS for batters, and ERA for pitchers. The goal is to gauge how much Harper and Machado are really worth based on how big an impact they could realistically make right off the bat. Keep reading to see my research and some interesting “Baseball Bits” that I found through my research. Harper and Machado both apparently want over $250 million. Only 1 free agent hitter since 2006 (Alex Rodriguez, 10 years, $275 million) received that much, and he saw a significant decrease in both oWAR and OPS the next year. Robinson Cano (10 years, $240 million) made almost that much and saw a mild to moderate decrease. Very few of the free agents since 2006 saw their WAR, OPS, or ERA improve on their new contract. You have to take into consideration that Harper and Machado are younger than any of these free agents. However, 3 of the 4 free agent batters who saw an increase in WAR or OPS were actually 30 or older. This may be due to the fact that it’s easier to judge an older free agent. But both Harper and Machado entered the league as teenagers and have proven themselves throughout the years. Finding the right young free agent is hard, as it’s not everyday that two proven 26-year old sluggers hit the open market in one off-season. I also saw different results among free agent pitchers, as both pitchers who saw either their ERA or WAR improve on their new contract were under 30. Plus, both of the free agent batters who saw their stats improve had an oWAR between 4.0 and 5.0 the year before signing, just like Harper and Machado did in 2018. However, it’s not like the teams in the market for Harper and Machado necessarily expect better stats throughout their new contract, especially if they’re looking to sign 8-12 year deals. Some might not even expect improvement from 2018 to 2019. But you should expect your $300 million dollar free agent to improve the next year. The real question is, should anyone (even the Dodgers) pay Harper or Machado $300 million? Similar contracts that have been signed in the last 10-12 years have not ended up working out so well. Alex Rodriguez signed a 10-year, $275 million deal with the Yankees in 2008 (the most among the free agents I researched). He was a star player for the Yankees early on in the contract, but his stats saw a decline in Year 1 of the contract, and by 2015, his stats had declined significantly. Maybe the steroids had something to do with it (2014 was the year he missed for steroids), but he was no longer the same A-Rod when he returned from his suspension, and he ended up retiring the year before his contract expired. The only other free agent batter who even came close to receiving that kind of contract was 2B Robinson Cano, who signed for 10 years, $240 million with the Mariners in 2014. Things have worked out in the first half of his contract, but he didn’t quite play at the level he did with the Yankees. Who knows, maybe he will improve after being traded to the Mets and returning to New York City, but so far, he has begun to slowly decline during his new contract. He’s still a key piece in the lineup, but he made even more of an impact with the Yanks. Harper and Machado are a unique situation, but it would be silly to give them $300 million only for them to decline significantly. I can’t see any team giving Harper or Machado much more than A-Rod without regretting it later. They are younger and Harper nearly won the Triple Crown in 2015, so maybe they’re worth a little more, but not $300 million. I don’t think Machado is worth more than A-Rod, and his attitude has turned some teams off. I think he goes to the White Sox, but it would be ridiculous to give him much more than $25 million/year. A 10 year, $260 million deal could work. As for Harper, he may be worth a little more due to his MVP season, and the Dodgers should be willing to bid a little more after their trade with Cincinnati. But he’s still not worth $300 million or more. 9 years, $288 million would be more reasonable. The Dodgers may end up giving him over $300 million, but I don’t think it’s worth it. That’s all for this edition of Baseball Bits. Stay tuned for more MLB coverage soon, including my MLB 2019 Season Predictions (which will come after the NFL season ends and Harper and Machado finally sign).